Asbestos refers to a group of six different minerals that occur naturally in the environment. Asbestos is resistant to heat and because of this property; it has been mined and widely used in a variety of industries and products. One major use of asbestos was in building materials and insulation. Workers can still come into contact with asbestos in building materials, especially during remodeling, when old damaged walls, ceilings and pipe fittings are repaired or removed. As asbestos ages, it eventually becomes loose and “friable” (crumbly and easily disturbed). When asbestos becomes friable, it is easily dispersed into the air, and can then be inhaled by workers. Inhalation of asbestos fibers is the main route of exposure, but these fibers can also be swallowed and cause skin problems. Asbestos fibers vary in length and shape but are often microscopic in size and therefore can bypass the lungs’ natural defense mechanisms. These microscopic fibers can be deposited into the deepest tissue of the lungs and can reside there for the remainder of a person’s life. Exposure to asbestos increases the risk for the development of certain types of cancers, primarily of the lung, but also cancer of the throat, esophagus and gastrointestinal system. Asbestos is also known to cause a rare type of cancer – mesothelioma -- a cancer of the lining of the lung. Asbestos may cause two types of conditions that are not cancer. Asbestosis refers to scarred lung tissue caused by asbestos fibers. The scarring makes it hard for lungs to do their job of getting oxygen into the blood. Asbestos-related pleural disease refers to the scarring or thickening of the lining of the lung (pleura). Asbestosis, pleural scarring and asbestos-related cancer are "dose-response" diseases. This means that the more asbestos a person is exposed to, the higher the risk for developing these diseases. In addition, all asbestos-related diseases have long latency periods. This simply means that it takes a long time from the initial exposure to asbestos to the time the disease becomes evident. For lung cancer, it could take up to 30 years from the time of exposure until the cancer actually shows up. For mesothelioma, it may take 40 years. Generally, asbestosis takes between 15 to 20 years to show up on a chest x-ray. The most common symptoms of asbestos-related lung disease are shortness of breath and coughing. The symptoms may be mild to severe, depending on the extent of the scarring. If asbestos exposure has been extensive, a person may become very sick -- developing severe breathing problems or breathing failure -- and may even die. In addition, other medical problems, such as lung infections, can be made worse by the presence of asbestos-related lung disease. Prompt medical attention at the first sign of a chest infection is therefore recommended for individuals with asbestosis. Depending on the situation, doctors may give a flu or pneumonia vaccine as a preventive measure. While there is no current cure or treatment available for scarring of the lung, certain interventions (such as stopping cigarette smoking) can and should be implemented to help preserve breathing function. Smoking cessation in general is a strongly recommended health practice. However, this step is even more imperative in an asbestos-exposed person who smokes. Research has shown that asbestos-exposed workers who smoke may be 50 times more likely to get lung cancer than a non-exposed worker who does not smoke. Control of asbestos exposures should be done as a preventive measure. By the time asbestos-related disease appears, it is too late to reverse the damage; stopping exposure at this point only prevents the disease from getting worse. An examination by a physician trained to recognize signs of asbestos-related disease can help identify some of the health effects of asbestos. The most common test used to determine if the lungs have been affected by asbestos exposure is a chest x-ray. A doctor qualified to evaluate if there is evidence of asbestos exposure on a chest x-ray is known as a B-reader. 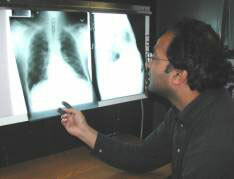 A B-reader evaluates a chest x-ray according to a system developed in 1950 by the International Labor Office (ILO) and the latest set of guidelines for this system is known as the ILO-2000. This system reviews the chest x-ray film for the presence of opacities (hazy streaks or spots), thickening of the pleura (lining of the lung), and various other findings (such as emphysema), as well as evaluates the technical quality of the film.